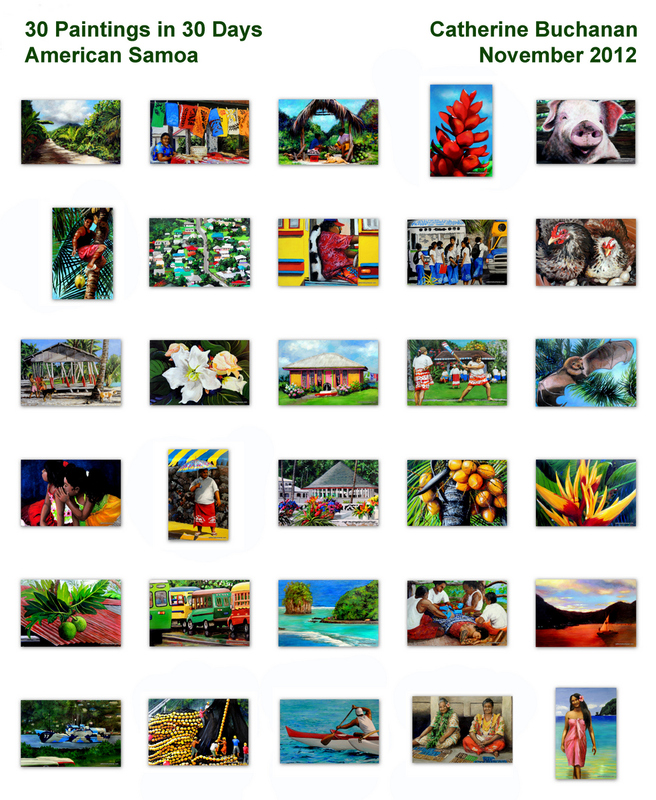 30 paintings in American Samoa, Finished! Thank you so much for following these posts, it means the world to me when people look and comment. Sadie's Hotels sponsored my time in American Samoa and I am very grateful for my month at this lovely resort on the beach. And many thanks to the Feleti Barstow Public Library for giving me a great room with a view to work for a month, new friends AND for purchasing the entire series for permanent display. I am over the moon! 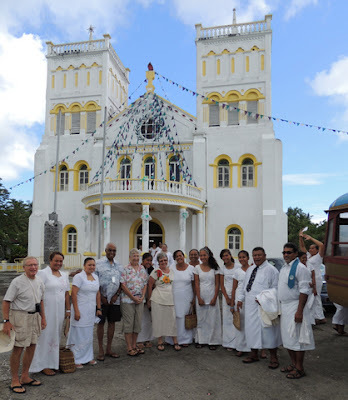 American Samoa is a fun place to visit, people are warm and friendly. There is nothing quite like a Polynesian smile, they put their heart in it. Everyone who wandered in to see the paintings in progress and the staff at the library made me try to be a better painter because they were genuinely interested. I've never painted in public before and have enjoyed how people responded and asked sincere questions that I could answer on this blog. Nobody turned me down when I asked if I could photograph them. I love this place. Hope this has inspired a few people to visit. My friends from Molokai who have been here all week left happy for having made the effort. They commented often on how genuinely friendly people were to them. I'm sad, yet a little relieved to be finished, but that's how it goes with marathons. 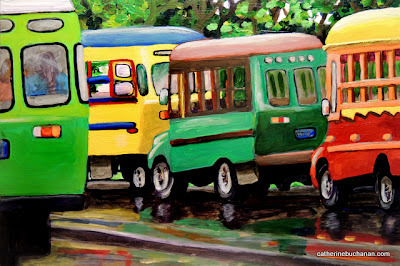 Special thanks to my sister Mernie (mernie.com) for all the encouraging emails, you always seem to get me through the moments when I am ready to throw my paint brushes at passing cars. You rock! One evening last week a ship entered the harbor and as it drew near the unusual paint job caught my attention. I grabbed my camera and managed to get a quick shot before it passed out of view. 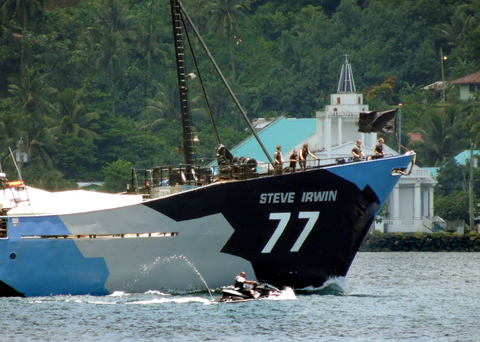 When I found my glasses, dang if it wasn’t the Steve Irwin, Sea Shepherd’s flagship. Sadie’s by the Sea is not far from where the ship docked for a week. The crew often visited the café or as the owner put it when I asked if he’d met any of the crew, “Yeah, they’re crawling all over the place.” What fun. Defending whales in the Southern Ocean from harpoon cannons requires nerves of carbon fiber. 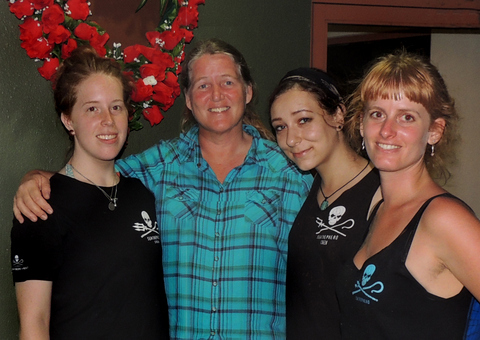 They are dedicated crew of adventurer’s protecting wild animals at all cost in an International Sanctuary from poachers. It’s bloody cold and risk is a between meal snack. I could not help being a little star struck. 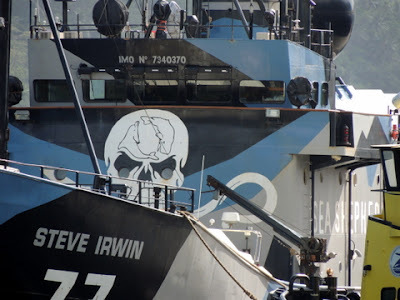 I didn’t ask a lot of questions even though I wanted to, but I will follow their news, hope they stay safe and achieve their goal of zero whales killed by the Japanese fishing fleet this year. To donate to their cause visit seashepherd.org. They are amazing people doing incredible things and it was a privilege to meet them. 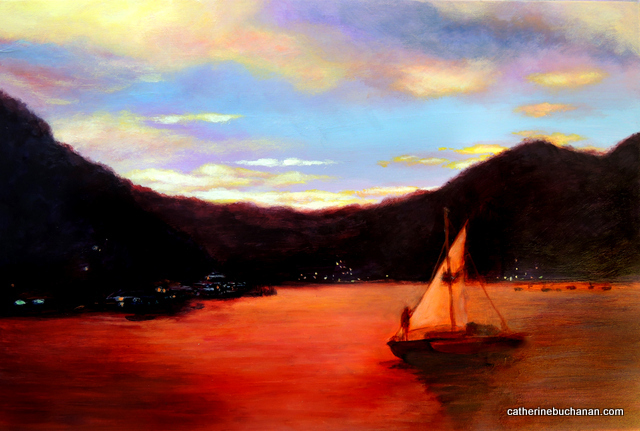 The painting is a composite from two photographs, one of mine taken in Pago Pago Harbor and the sailboat from Malcolm Gaylord. Overly emotional sunset paintings make my eyes roll, which might be why I didn’t think to include one until Lilly asked. 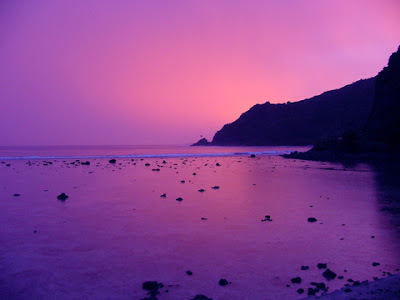 Every so often the sky and water turn insanely pink, orange, yellow and purple and I’m not sure if it is exaggerated near the equator, but it seems so. It is moving and usually very brief. 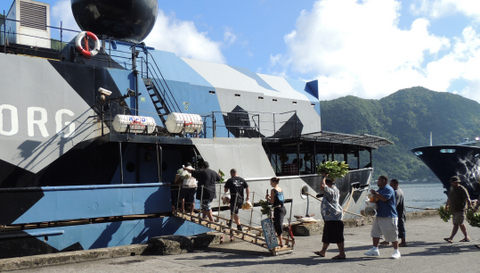 Here’s another photo Malcolm shot from the road in American Samoa. It’s nearly unbelievable even as a photo. And I'm done! Today made 30 days, but I'm behind a day on posting the last one. In a perfect world I would have been up to date, but I've had a few challenges during the last 30 days. The first week my insides experience something like dysentery, the second week I was attacked by a vicious pack of dogs and sat in the ER during the usual Saturday night rush. 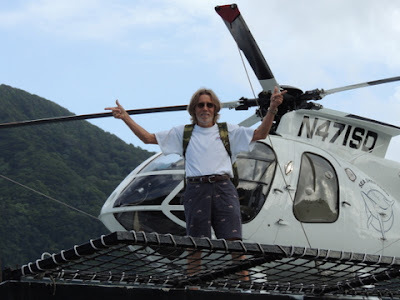 Old friend's are visiting from Hawaii and then one of Sea Shepherd's boats sailed into Pago Pago Harbor and I made a few new friends. Will get the last post done tomorrow. This month has been as wonderful as a hot pink sky. 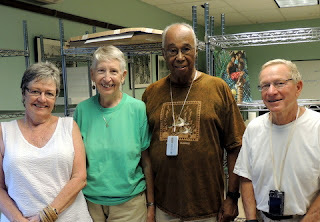 When I first started painting at the library Mary (who is on the staff) asked if I'd like to look through her pictures. 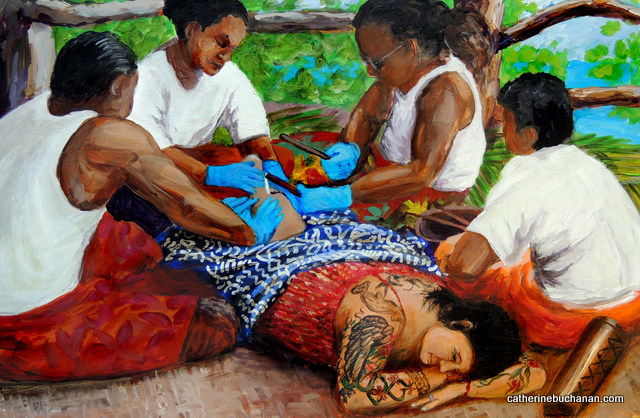 I chose this one because traditional Samoan tattoo is an elaborate process, which attracts only the bravest souls. Two people pull the skin tight and the tattoo artist taps the ink into the skin with a sharp instrument and mallet. This picture was taken by Mary's sister at Tisa's Tattoo Festival, a yearly event in October in American Samoa. Thanks Mary for all of our conversations and for cracking me up. I love your style, you truly are a work of art inside and out. All but two of the paintings are from pictures I have taken. I have permission to use them and give credit where it is due. The photographs I've been working from are next to the paintings for now so people can compare them. 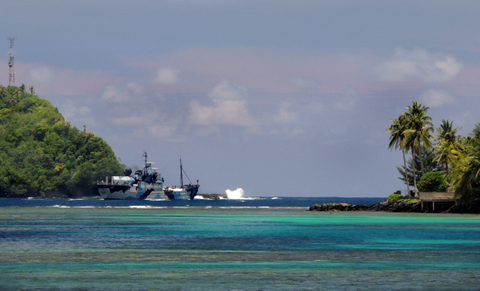 Since this project is about American Samoa, I only used photographs taken here. Most of the paintings are of candid shots of people doing things. In street scenes with a lot of people I don’t ask everyone for permission. For close up pictures I either ask or hold up my camera so people have the option to say no if they don’t feel like being photographed. Many of the photos are from events where I was invited to take pictures. The first painting of the two girls was taken at a wedding at Sadie’s by the Sea. I have photographed the staff at the hotel for the web site and so far no one has said no. When I can I print people’s pictures and send them to them. 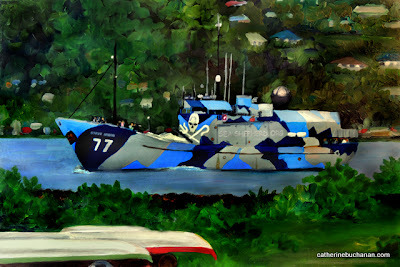 I don’t ask permission to do the paintings from the photographs though. Under United States law I’m not required to since our government doesn’t limit creative expression for original artwork. But I need to obtain permission to reproduce the paintings if people are recognizable. In most of these paintings they are not, but some of that is just lack of skill. The questions were asked with a slight degree of suspicion. I suppose to find out if I am a user or not. I have heard that there are no copyright laws on the books in American Samoa and no one I have asked knows if there is precedent on that particular subject. Regardless, I ask people for permission to photograph them because it is polite. I have not asked before doing the paintings since I didn’t know who many of the people are or how to contact the ones I do. Hope they find me. Good question, the answer is a resounding yes. I’ve painted in a lot of places and find that humid air is the best for acrylic paint since it dries slower. Hot dry air is the worst. I was snowed in once and the heater just wrecked the paint, if I turned it off I froze so that didn’t work. I’ve tried painting outside a few times, but the paint dries too fast in the wind and bugs get stuck in the paint. Humidity is great. I’d say American Samoa indoors with a little air-conditioning is the perfect climate to paint. It is a huge challenge to come up with a new painting day after day and since it is difficult it is never boring. Another good reason is that practice is the only way to get better, just like going to the gym. If you work out you get results. 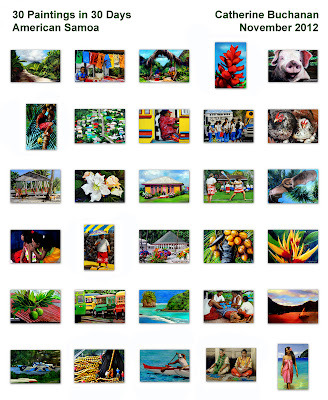 When I did 90 paintings in 90 days and posted them on my blog a lot of people looked at the posts, which surprised me. It’s not easy to get artwork in front of an audience. Online though people can look at the paintings at home so the audience is larger than if you all had to drive to a gallery. 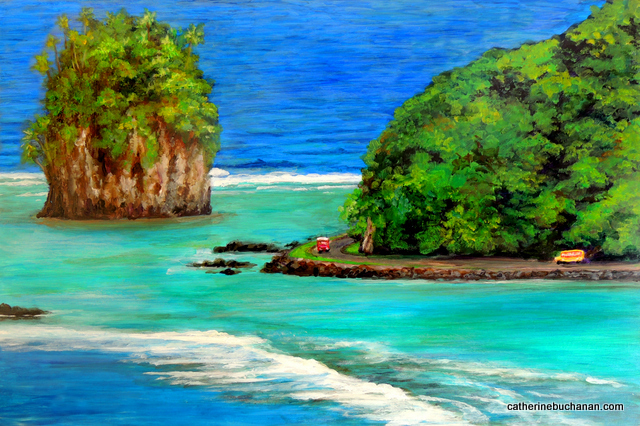 The director of the library invited me to come to American Samoa for this project and I had many months to think about what I wanted to paint. I rejected a few ideas, like portraits of faces because they are too difficult to do in a day. 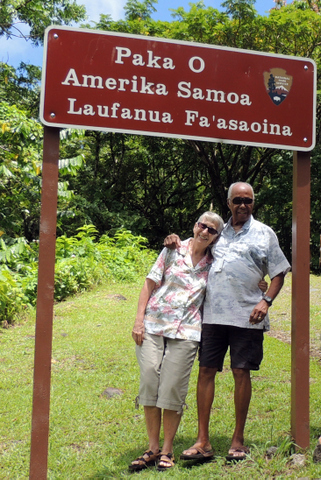 I looked through many thousands of pictures I’ve taken in American Samoa and chose the images for graphic appeal, color and subjects that you would see if you toured the island. It is a visual record of the beauty, daily life and scenery from a visitor’s perspective. I have always loved being here and I hope that comes through in the paintings.